14 year old schoolboy Rhys Irwin is tipped to be a future Motorcycle Racing star. In just two years racing he has set the standard for young Irish racers with championship & race winning performances along with setting numerous lap records. 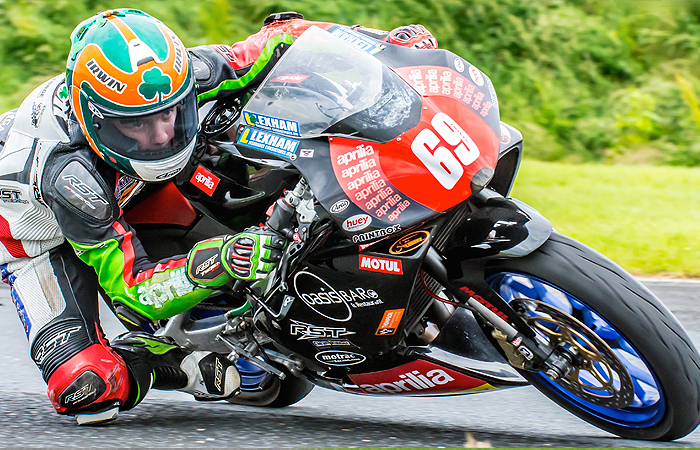 Rhys’s progress has been recognised with nominations for a number of sports awards and invitations to the Red Bull Rookies selection event in Spain and the Irish Young Racer of the Year award final. In 2017 Rhys moves up a level to the Aprilia 450RRV series whic is part of the Thundersport Championship. Rhys will race his Aprilia in all the British Championship rounds and selected Masters Superbike Championship Supertwin races. Donegal Motocross Champion three years running. Switched to Circuit Racing competing in the British Superteens championship with occasional Irish appearances. Took two podium finishes on his first ever circuit racing weekend at Brands Hatch. Finished 7th in the British Superteens championship in his debut season. Took second place at the ‘Sunflower’ International event despite riding an underpowered Superteens machine. Runner-up in the British Superteens Championship. 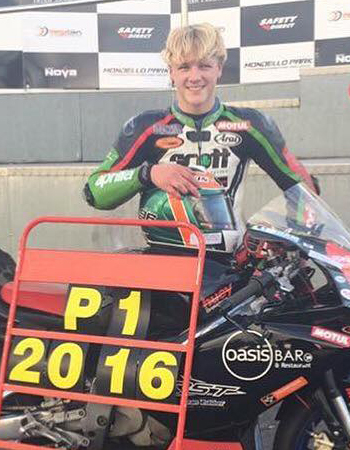 Most successful ever Irish rider in Superteens with six wins and twenty five podiums. Masters Superbike Championship Production Class Champion. New Mondello Park National Circuit lap record. New Mondello Park International Circuit lap record. Nominated for the Masters Superbike Championship Young Rider of the Year award. Only Republic of Ireland rider invited to the Red Bull Rookies final. Eight Irish Young Guns Challenge wins and ten podiums from ten starts. Due to his age Rhys is still restricted to lower powered machinery and so will continue in the Thundersport UK Aprilia ‘one-make’ series, stepping up to a 450cc machine. Rhys aims to go one better than in 2016 by becoming British Champion. Rhys will also compete at home in the Masters Superbike Championship when the Thundersport calendar allows. At home Rhys will ride his 450 Aprilia machine in the Supertwin class, competing against more powerful 650cc machinery. Long term Rhys aims to race in the British Supersport Championship as the first step on the ladder to a career as a professional motorcycle racer.